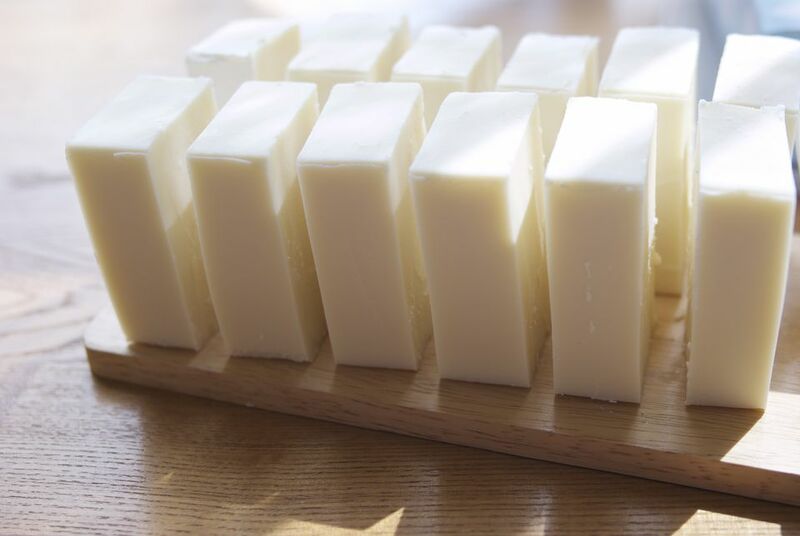 Few developments in the history of soap making have made as significant an impact on the industry and craft as the production of laboratory-made lye. But lye wasn't made in large-scale labs until the mid-1800s and has been available to the home-based soap maker only the past few decades. While it has been more difficult to procure in recent years, it is still widely available to soap makers. Thousands of years ago before soap was available, people made their lye the old fashioned way by leaching water through wood ashes layered in a barrel or other container. If you're in a far corner of the globe and can't get lye locally, or are just curious how it's made, you can make potassium hardwood lye yourself. However, you will need specific supplies and will have to follow several steps using safety equipment. Lye is an alkaline solution that is used to make soaps, as a cleaning product, and sometimes as a solution to cure foods. It is potassium hydroxide, sometimes called caustic soda, and has a pH of about 13. This level of alkalinity can burn your skin and corrode some materials so you need to take precautions when making lye. One way to produce lye is with rainwater and hardwood ash, which you will have to collect. For this method, you need a wooden barrel, metal containers for the ashes, a rain barrel to collect the water, and safe containers to capture the leached lye water. A drill is necessary to make the holes in the barrel, and you will also need small pebbles and straw. Ph testing tools, such as strips or a meter, are helpful when testing the lye. It is crucial you wear safety goggles, rubber gloves, and boots to handle the lye water safely. To make this type of lye, you need the white ashes from hardwood fires. Collect ash from fires that burned wood such as ash, hickory, or beech. Softwoods, such as pine, spruce, or fir, do not contain enough potassium, which is necessary for making lye. Because the potassium doesn't burn away in the fire, you can leach the nutrient out of the ashes using water. After the fire has gone out, let the ashes cool for a few days before collecting them. You will need enough ash to almost fill the wooden barrel. Store the white ashes in metal containers. Place the rain barrel under the eves of your house to catch as much water as possible. You will need to have a filter on the top of the barrel to keep out any debris and leaves. Collect about 10 pints (4.7 liters) to make the lye. After you fill the barrel with ashes and rainwater, the liquid will need to drain out of the bottom of the barrel. Therefore, you need to drill a few holes, using a small drill bit, near the center of the bottom of a wooden barrel—about 6 holes will do. You will be placing a bucket under the barrel so be sure to drill the holes in the space that will sit above the bucket. Once the holes are drilled, place a 1- to 2 -inch layer of small clean pebbles on the bottom of the barrel; just be sure the stones are bigger than the holes. Then add about 3 inches of straw on top of the pebbles. This acts as a filter, allowing the water—and not the ashes—to drain out. Before setting up the barrel, you need to find a good location for it; try to place it where it is protected from storms and rain. Putting it near the rain barrel will also make transferring the water easier. In order to place the bucket that collects the liquid below the barrel, you will need to first raise the barrel up. To do this, prop the barrel on sturdy blocks or a wooden frame that is high enough to fit the bucket underneath. Position a lye-safe bucket so it lines up with the holes you drilled in the bottom of the barrel. Stainless steel and heavy-duty plastics are often lye-safe, but aluminum is not. Now it is time to transfer the white ash into the barrel. Fill the barrel with the wood ash, placing it on top of the straw, to within 4 inches of the top of the barrel. Slowly pour the collected rainwater over the ash so that the ash is wet but not soaking. It is easiest to fill buckets with the rainwater first, and then pour each bucket into the wooden barrel. Once the ashes begin to float and you can see the water line, stop filling the barrel. Note how many buckets of rainwater you add so you know how much lye water will be produced. You will need enough lye-safe buckets to match the amount of water you add to the barrel. You do not need to place a lid on top of the barrel unless it has been placed in an unprotected, open area. Before you can collect the lye water, you need to put on the safety equipment. Wear elbow-length plastic gloves, safety goggles, and boots when handling the lye water. It is time to collect the lye water when it is within 4 inches of the top of the bucket. Carefully remove the full bucket, being sure not to spill, and replace that bucket with another lye-safe bucket. Before you can use the lye to make soap, you need to make sure it is the right pH. To do this, you will need either pH test strips or a pH meter. If you have neither, you can use a potato—if it floats, the lye is ready; if it sinks it is not. The pH of each bucket of lye water needs to be 13 or more. If it is below 13, carefully pour the bucket of lye water back into the wooden barrel and collect it again. Repeat this process until your buckets of lye water are at a pH of 13. It will most likely take at least one more run through the barrel to reach the right pH level. Take care not to splash when pouring the liquid back into the barrel as the water can burn your skin. Once you have the lye at a pH of 13, you are ready to use it as you wish. You can use the lye water to make soap, unclog drains, or cure olives.